Urgent-Care on wheels provides services to our members only. for services like, blood draw, ECG, chest-ray, wound care or IV injection and more. 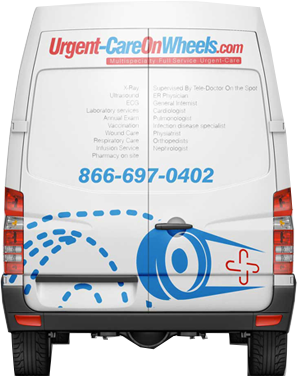 You can also track our Van at “urgent-careonwheels.com” website and call on duty nurse directly to schedule an appointment with PA/NP or nurse. If needed PA/NP or Nurse can request virtual visit from a general physician or specialist to join in during the visit. give you a medication/ injection or breathing treatment right there. Walk-ins are also welcome, although there may be short wait. Ankle Sprains – If you sprain your ankle, just locate an Urgent Care On Wheels truck near you via the map on this site. Call them to schedule an appointment or just walk in for a quick examination with the Nurse/PA/NP. The on site technician can do an x-ray of your ankle right there on the spot. If needed, he/she can invite an ER or Orthopedic physician for a consultation and treatment option right there, with the use of our telemedicine technology. Cough or Fever – If you have a cough or fever, visit our doctor on call at www.doctoroncall24x7.com for real-time virtual visit. The physician can see you face-to-face, examine you through an USMD-Kiosk in your office and he/she can refer you for a chest X-ray or blood work to be done in our Urgent Care On Wheels truck for fast care. Or simply locate our Urgent Care on Wheels truck on our website and book an appointment and get seen right away for immediate care. How do I get care? – Locate the Urgent Care on Wheels truck near you via the map on our website. As the tuck approaches close to your office, you’ll receive an alert. Just walk down for better care, right there at work. Traveling Overseas – If you are traveling overseas, visit our travel clinic, see a virtual physician right-their or via an appointment. The physician can send you downstairs to the Urgent Care On Wheels truck for vaccinations, right there at work. Annual Examinations – If you want an annual examination, just locate an Urgent Care on Wheels truck near you or schedule an appointment for a physical examination, blood work or an ECG done right there under the direct supervision of a virtual physician inreal-time. What are the benefits of using your service? – No more traveling to the doctor’s office, losing time in traffic or the waiting room.